Vous pouvez également utiliser 14000 Kobo Super Points pour l'obtenir ! UNSUSTAINABLE frames the problem of cost and effectiveness in AmericaOs public schooling system, and provides a strategy to address it. It argues something that many education professionals and policy makers have come to believe but rarely mention: That this countryOs system of K-12 schooling is not sustainable and is becoming a poorer value each year that goes by. 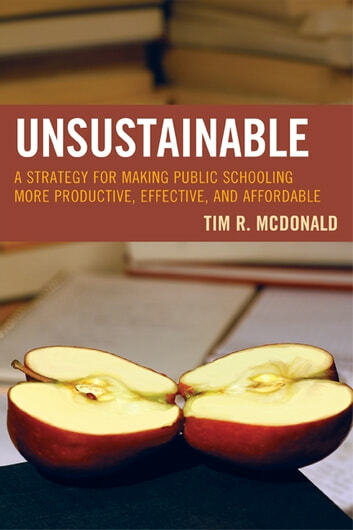 It argues for improving the cost and effectiveness of public schooling through a strategy of innovation that targets productivity. Addressing the question how to do this, the book provides policy recommendations to the state, district, and federal levels. In a final chapter it outlines uncommon strategies for overcoming some of the most difficult political, practical, and structural roadblocks to improvement.